Mosaik enters the wireless test & measurement market with its exclusive licensing deal for XenSurvey, a leading cloud network analytics platform. With this deal, Mosaik will offer the XenSurvey app that enables telecom professionals to measure and compare the performance of mobile and wireless networks at any given location, without the need for expensive equipment. Mosaik Solutions opened its doors nearly 26 years ago when they began developing roaming guides, at the beginning of cellphone usage, said Gilmer. As they were collecting data for maintaining the guides, customers requested they also make marketing coverage guides. 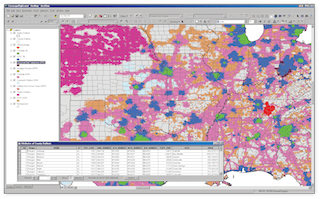 When everything went electronic in the early 2000s, Mosaik began to offer coverage information in geospatial format with a MapInfo product. 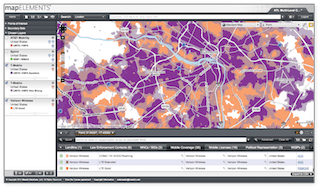 Now they offer that same information in Esri shapefiles as well for traditional mobile wireless operators such as Verizon and AT&T, as well as wireless coverage for internet service providers. MapELEMENTS is a web-based SaaS platform. There is no installation required by customers. Customers can search by location, market or county. Settings tab allows for cool features including shared session, ability to upload POIs, infrastructure module or tower locations, and adding to a mapping session. Customers can choose a standard base map in OpenStreetMap, can also choose from satellite hybrid maps, and use the data with an infrastructure module. 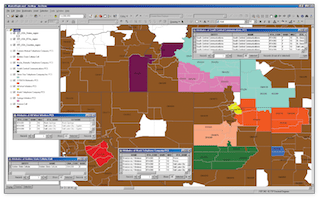 MapELEMENTS is designed to be a tool to be used by company employees, all the way from the CEO to roaming teams to network management teams to customer service, and they don’t need a GIS background. Most people can quickly figure out to navigate this solution. Using up to seven Android smartphones, carriers can conduct drive tests to see how their network compares with the competition and measure signal strength, downlink and uplink speeds, and latency. Users can test the network as often as every two minutes, every 30 minutes or at longer intervals. The data lets network testers get a more complete picture of the network over time, CEO Bryan Darr said in an interview with FierceWireless, adding that users can do drive tests or see how a fixed location in the network with highly concentrated congestion performs over time. Darr said, tower companies and cell-site providers can load the data into Google Earth and recommend to carriers that they need towers in a particular area because of weak signal strength. This entry was posted on Friday, October 3rd, 2014 at 8:59 am. You can follow any responses to this entry through the RSS 2.0 feed. You can leave a response, or trackback from your own site.